Southern Illinois University Edwardsville’s Healthcare Diversity Summer Camp has been the catalyst for encouraging students to pursue a healthcare career and bringing some to the University. “Last year’s SIUE Healthcare Diversity Camp was the deciding factor for me coming to SIUE,” said Jordan Robinson, who plans to attend the University in the fall and major in pre-medicine. Robinson plans to start her journey pursuing a healthcare career at SIUE and learn as much as she can. Twenty-five high school students from Madison, St. Clair and St. Louis counties are participating in the seventh annual SIUE Healthcare Diversity Camp this week. The camp involves the SIUE Schools of Pharmacy (SOP) and Nursing (SON), and the SIU School of Dental Medicine (SDM). “The purpose of the camp is to expose minority high school students to healthcare careers they may have never considered,” said Lakesha Butler, PharmD, camp coordinator and SOP clinical associate professor. Also helping to coordinate the camp are Jerrica Ampadu, PhD, SON assistant professor, and Cornell Thomas, DDS, SDM assistant dean. The camp pre-requisite for high school sophomores, juniors and seniors is to have at least one year of math, one year of science and a grade point average of 3.0. The average student GPA this year is 3.7. “Participating in summer camp increases access to nursing and nursing opportunities for minority high school students,” said Ampadu. “During summer camp, students are immersed in learning through simulation as well as through interactions with nursing faculty. “In addition to information about admission requirements into the school of nursing, students are introduced to nursing advisors who continue to communicate with and mentor students after camp has ended,” Ampadu added. Other benefits of the camp are exposure to SIUE campus life and learning how to better perform on the ACT. The success and continuance of the Healthcare Diversity Camp is important, because of the ongoing need to have underrepresented minorities in the healthcare field, according to Butler. Yasmyn Knight attended the Healthcare Diversity Camp in 2011. She is now a 4th Year pharmacy student at SIUE, anticipating graduating with her doctorate of pharmacy in May 2017. “Pursuing a profession within the healthcare field was always a goal of mine, but I found myself a bit discouraged by the low representation of African American physicians practicing within our society,” Knight said. “After the first day of camp, my eyes were instantly opened to the endless possibilities that SIUE and the field of pharmacy had to offer. “It was also encouraging to witness the number of faculty and student pharmacists who took time to mentor high school students,” she added. After receiving her professional degree from SIUE, Knight plans to help the disadvantaged and underserved through the most accessible healthcare assistance that she knows – pharmacy. Diversity in healthcare is a “win-win” for everyone involved, according to Thomas. “Diversity in healthcare makes us all better. We all benefit from an environment that empowers all of us to achieve to our highest potential, without fear of prejudice or bias,” he said. Toju Choms Eguke, of Afton, Mo., has an interest in dental medicine. Eguke wants to invent products to improve oral health by preventing decay and bad breath. “I can’t wait to go to the School of Dental Medicine and see how everything works over there,” said Eguke, who hopes to one day open his own dental practice. The camp is made possible by an annual $5,000 grant from Walgreens, which provides diversity grants to schools of pharmacy across the nation. 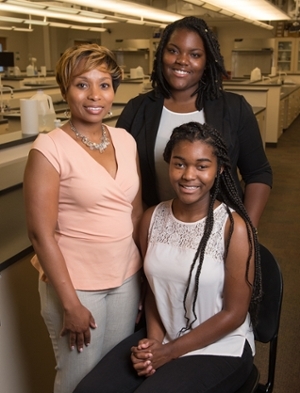 L-R: Dr. Lakesha Butler, SIUE Healthcare Diversity Summer Camp coordinator; Yasmyn Knight, 2011 diversity summer camp participant and 4th Year SIUE pharmacy student; and (seated) Jordan Robinson, 2015 diversity summer camp participant and incoming SIUE freshman.